The collect and readings for today, the Feast of the Holy Trinity, may be found here. The appointed gospel is John 16:12-15. Today is the Feast of the Holy Trinity, a day that many understand as being devoted to and focused on a doctrine. While there is some truth in that understanding, it is, I believe, only a very small piece of what today is about. The greater truth is that we live Trinitarian lives. We live, move, and have our being in the Blessed Trinity. We pray to the Holy Trinity offering ourselves, joys and sorrows, concerns and thanksgivings in the name of the Father, and of the Son, and of the Holy Spirit. We are baptized into new life in the name of the Father, and of the Son, and of the Holy Spirit. Every Thursday three or four people gather in the chapel to be anointed in the name of the Father, and of the Son, and of the Holy Spirit for the healing of their body, mind, and soul. Each Sunday the Father, the Son, and the Holy Spirit sanctify our offerings of bread and wine that they might become the food and drink of eternal life. On a regular basis we bless people, pets, and things in the name of the Father, and of the Son, and of the Holy Spirit. The prayers at the beginning of our burial liturgy remind us that we entrust those who have died to the care of the Holy Trinity. We are Trinitarian people. From beginning to end and everything in between, our creation, birth, life, and death, are constituted, sustained, and filled by the Father, the Son, and the Holy Spirit. So to see this day, this holy feast, as nothing more than a concept of numbers in which one equals three and three equals one is like saying a wedding anniversary is simply the remembrance and celebration of the concept of love. Concepts, whether of love or the Holy Trinity, rarely, if ever, sustain or transform our lives. Instead, our lives are sustained and transformed by relationships and experiences. Try to define love or explain to your spouse why you love her or him. Make a list, count the ways: you are pretty, smart, funny; we have a lot in common; we enjoy the same things; you are fun to be with; you are a good cook; you have a good job; you are a good provider; I am attracted to you; you make me happy. The list begins to sound shallow, superficial, and you know at a deep level that list does not even begin to reflect your love. How can words ever describe or capture the beauty and mystery of two lives shared, given, and received? How do you talk about giving yourself to another so completely that you live within the other, not losing yourself but finding your true and complete self? Words fail. Some things, like love, cannot really be talked about. They can only ever be experienced. Likewise, try to define the Trinity and you end up with nonsensical math in which 1+1+1=1. Or you hear bad and, most often, heretical analogies: God is like an egg and the three persons are the shell, the white, and the yolk of the egg. The Trinity is like the three musketeers, all for one and one for all. At best we are left confused and at worst we decide this whole Trinitarian thing is outdated and irrelevant. How can words ever describe or capture the beauty and mystery of three lives shared, given, and received? How do you talk about three persons giving themselves to each other so completely that they live within one another, not losing themselves but finding their true and complete self? Words fail. Some things, like the Trinity, cannot really be talked about. They can only ever be experienced. The experience of and participation in Trinitarian love is where the gospel is taking us today. than in our Trinitarian understanding. In today’s gospel Jesus speaks of the Father and the Spirit and the relationship the three of them share. It is not a lecture about the Trinity. He does not describe what they are but rather, how they are. According to Jesus this is how they are. They are in complete relationship. All they have is given, received, and shared. Nothing is withheld. Nothing is secret. All that the Father has is Jesus’. All that Jesus has is taken by the Spirit and declared to us. We are included in the life and love the Holy Trinity. All that the Father, the Son, and the Holy Spirit have is being given and made available to us. Nothing is withheld. Nothing is secret. The Feast of the Holy Trinity is the feast of God’s life and love united with ours. It is the reality that unity and diversity, the one and the many, are not opposites. Rather, they necessarily constitute each other. It is the celebration of sharing, giving, and receiving each other lives. It is the invitation to fully participate in God’s life and thereby in each other’s lives. 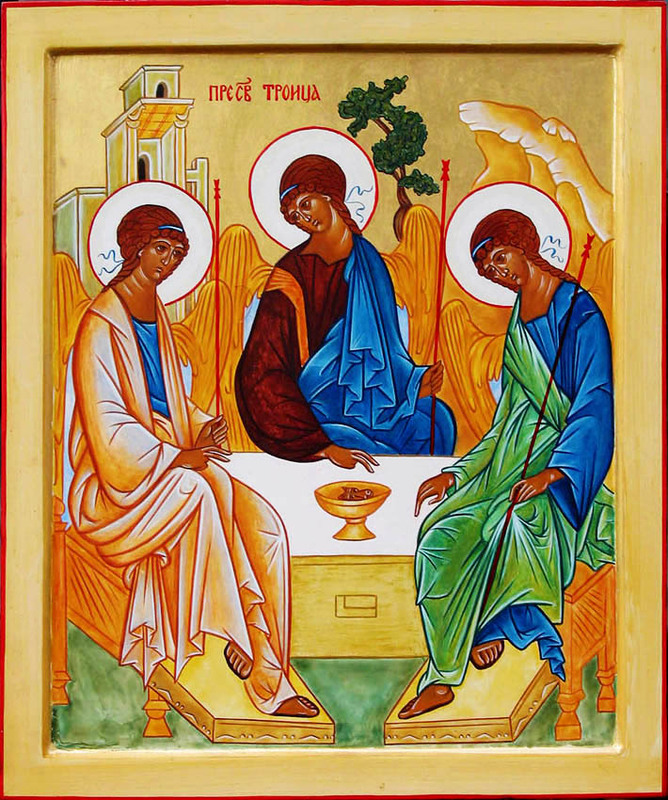 The Trinitarian life begins with the three, the Father, the Son, and the Holy Spirit, but it is not limited to the three. It is the ongoing dance of God’s being and existence. All are invited to join the dance. No one is denied an invitation and in God’s world everyone knows how to dance. This dance of God’s life and love is not, however, abstract. It is embodied and revealed through flesh and blood dancers that can touch and heal with God’s hands, see with God’s eyes, listen and discern with God’s ears, speak God’s truth, and love with God’s heart. The Trinitarian life is embodied and revealed through us. Wherever we are and whoever with we are with, there is God’s dance floor – in our families and marriages, in friendships, in places of reconciliation and healing, at school, in our workplace, at the food pantry, in our silence and solitude, in our recreation, in our joys and in our sorrows, in our concerns and in our thanksgivings. Philomena, thank you for your encouraging comment.